Development in Detroit’s Downtown and Midtown is front and center, but what about Uptown? What is its future? What role can the development of the site of the historic annual State Fair at the Michigan State Fairgrounds play? And, why should we care? Even prior to 2009, when Gov. Jennifer Granholm axed the State Fair, Michiganders had been concerned about its future. Her action was a precursor to its devised privatization when Gov. Rick Snyder signed a bill in 2012 transferring the 160-acre site at Woodward and 8 Mile Road into the Michigan Land Bank "Fast Track" Authority (MLBA). Usually, with such a significant parcel of land for development, more time would be designated for outreach to the community and for developers to submit proposals. However, with lightening speed, the land was awarded to Lansing developer Joel Ferguson and Greektown Casino's Marvin Beatty (partners of Magic Plus, LLC ) to develop a suburban style "power center" with big box stores, a theater complex, and a sea of parking lots. Is this what we need for the 21st Century? FAST TRACK TO THE PAST? OR DETROIT'S FUTURE CITY! Unable to halt the closure of the Fair with a 55,000 signature petition, grassroots activists surveyed their communities and, with the assistance of landscape architects and architects, crystallized the response into a comprehensive METAexpo Concept. 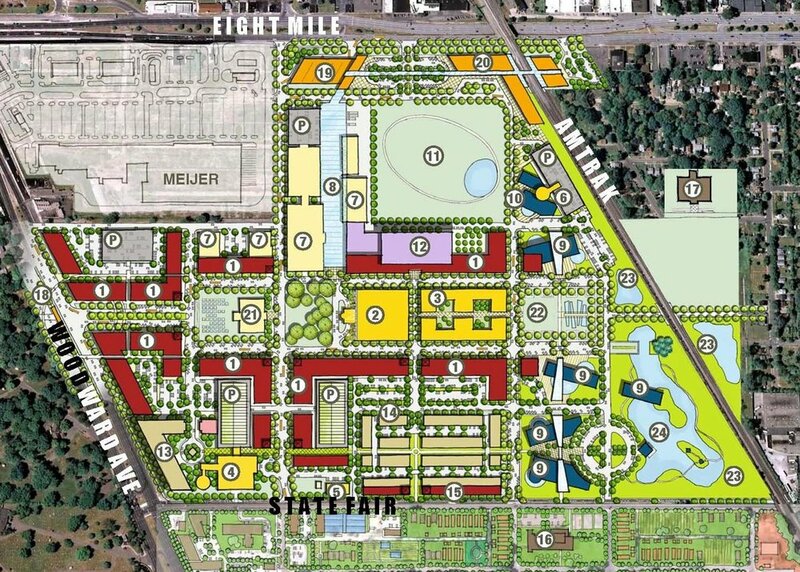 The activists coalesced to form the State Fairgrounds Development Coalition (SFDC), and forwarded its design vision to the Governor in November 2012 — concurrent with the MLBA's selection of Magic Plus LLC.